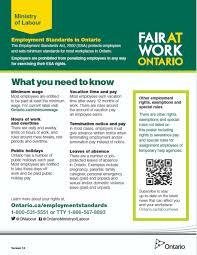 Due to the changes to the expected changes to the Employment Standards Act, 2000 (ESA), brought by Bill 148, the Fair Workplaces, Better Jobs Act, 2017, the Ministry of Labour has released a new version (7.0) of the ESA poster (for better view https://www.labour.gov.on.ca/english/es/pdf/es_poster_2018_1.pdf) which is required to be posted by employers in an obvious and visible place in the workplace. This poster briefly summaries certain standards under the ESA and also directs readers to the MOL website to find out more information. It is important to stay updated and know what your rights are under the law, please contact Monkhouse Law today at (416) 907-9249 for a free 30-minute consultation.